What does it mean to be documented or undocumented? How do these terms work across borders and boundaries, languages and nations? These are the questions fueling the experimental artwork-in-a-box, Documentado/Undocumented, a book art piece that explores the intersection of printmaking, typography, performance, video, sound art, and installation. In its traveling exhibition, a finely crafted aluminum traveling case is on display, opening into a tri-partite mirrored vanity containing a playful kit of objects, inviting the participant into an intimate space of engagement and transformation. Illuminated buttons trigger layers of audio, and a set of instructions invites the viewer to "Reimagine yourself / tell a new story / collaborate with others." Also on display is an exquisite, vividly illustrated codex created by book artist Felicia Rice, with texts drawing upon Mexican performance artist Guillermo G mez-Pe a's experiences and observations of the political, geographic, social, and psychological boundaries between the United States and Mexico. A video loop of G mez-Pe a performing various ritual acts is projected onto the gallery walls. 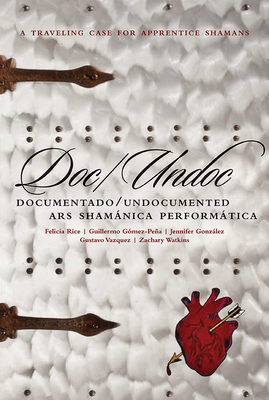 Doc/Undoc presents this multi-media, multi-disciplinary artists' collaboration in book form, documenting a unique and wildly ambitious adventure into the experimental realms of modern book arts. Included are a lush, photographic recreation of the installation, a reproduction of the codex, an essay by art historian Jennifer A. Gonz lez who situates the project in the context of bookmaking, performance art, and cabinets of curiosities. An introductory essay by Felicia Rice tells the story of the collaboration: its genesis, development, execution, and its ongoing intention. In addition, the book is packaged with a USB drive containing the installation version's original sound art by Zachary James Watkins and video art by Gustavo Vazquez.